Welcome to our “Keep Liquor Sales Public Campaign Page”. We will be adding to this page as the campaign progresses so please check back often for new information. Members of Local 470 and Local 1670 do good work keeping liquor out of the hands of minors during prom season. Please take a minute to look at the poster below. 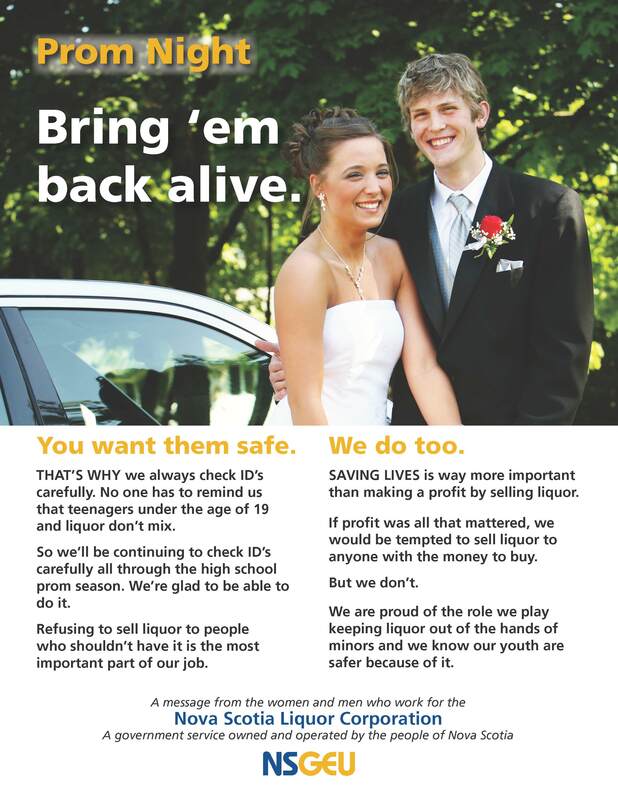 Keeping liquor public keeps our kids safe. This advertisement/poster appeared in the Cape Breton Post, Amherst Daily News, Truro Daily News and the Citizen Record last weekend, Friday/Saturday, June 21/22, in advance of the high school prom season. On January 23, 2013, PC party leader Jamie Baillie announced his support for selling liquor in grocery stores and corner stores. On May 23, 2013, the PC party released a “Discussion Paper” further advocating for the privatization of alcohol sales, making it clear that this will be one of their main campaign points in the next provincial election which we are expecting soon . One of the most disturbing aspects of Baillie’s “Discussion Paper”, was that he used MADD Canada to support his idea of making liquor available in corner stores and groceries, when in fact, MADD Canada had just published a policy paper which clearly outlines the reasons for keeping alcohol sales in the hands of Provincial Liquor Boards. . We immediately responded with a press release and President Jessome was interviewed on News 95.7. See our response to Baillie’s release here http://216.187.70.102/~dbriggs/nsgeu-fights-back-against-pc-proposal-to-privatize-liquor-sales/. The Provincial Council elected a Campaign Committee who met on June 19 and identified a number of initiatives to ensure our members have the information they need as Baillie continues to press for privatization. (Far from modern, privatization of liquor sales is an old idea that has not worked out well in other provinces like Alberta or BC where the quality of the service suffers and the cost actually goes up). The Committee wants you to know that as we lead up to the next election it is important to let your MLA know that you are not in favour of privatizing sales of liquor and that your job is important to your community and the economy. Click here for tips for writing to politicians. Click here for tips for meeting with politicians. Click here for tips on writing letters to the editor. A fact sheet will also be posted shortly which could help you prepare for meetings with your MLA. If you write a letter, send an email or arrange for a meeting, please cc us or send a copy of any correspondence to dslye@nsgeu.ca.